Perennials; (loose, spreading); caudex simple or branched; densely pubescent, trichomes (subsessile), 4-6-rayed, rays furcate or bifurcate, (moderately tuberculate over arms, less so or smooth over center). Stems few to several from base, ascending or prostrate, (arising laterally, also from within basal leaves, usually unbranched, rarely branched), 0.5-3(-6) dm. Basal leaves: blade narrowly oblanceolate or broadly elliptic, 1-7(-12) cm, margins entire or shallowly toothed, sometimes repand, (inner blades usually flattened in age, surfaces often gray-green, scabrous). Cauline leaves (usually secund); blade spatulate or obovate, 1-2.5(-4.5) cm, margins entire or shallowly toothed, (flat or involute). Racemes somewhat crowded (to moderately elongated in fruit, exceeding basal leaves). Fruiting pedicels (often divaricate-spreading and straight, or horizontal and loosely sigmoid, sometimes slightly recurved), 5-15 mm. Flowers: sepals broadly elliptic or oblong, 4-7.5 (-9) mm, (median pair thickened apically, cucullate); petals cuneate or obovate, 7-10(-16) mm, (tapering gradually to broad claw). Fruits subglobose to ovoid or ellipsoid, sometimes compressed, (4-)5-7(-9) mm; valves sparsely pubescent, trichomes appressed or erect, sometimes sparsely pubescent inside; ovules (8-)12-16 (-20) per ovary; style 2-7 mm. Seeds somewhat flattened. 2n = 10 + 2, 18, 20, ± 40. Flowering May-Jul. Sandy soils, limey knolls, rocky hills, clay hillsides, dry ridges, weathered rocks, gravelly outwashes, stony slopes, pinyon-juniper woodlands; 1500-2600 m; Ariz., Colo., N.Mex., Utah. 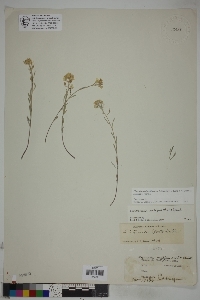 As here circumscribed, Physaria rectipes remains heterogeneous and may represent more than one taxon, even after the recent removal of P. pulvinata. Duration: Perennial Nativity: Native Lifeform: Forb/Herb General: Loose, spreading perennial herb, 5-60 cm tall, from a taproot and usually simple caudex clothed in old leaf bases; stems few to many, ascending or prostrate, usually unbranched; herbage grayish green and densely stellate-pubescent. Leaves: Basal leaves more or less arranged in a rosette, gradually tapering into a petiole, often early-withering; stem leaves long-tapering at the base, but blade and petiole are not strongly differentiated; blades oblanceolate, 2-5 cm long, 2-8 mm wide, with entire to slightly wavy or toothed margins. Flowers: Yellow, in dense terminal racemes which elongate a bit in fruit; pedicels straight or loosely S-shaped, spreading-ascending, 5-15 mm long; sepals 4, narrowly lanceolate, 4-5 mm long, yellowish green; petals 4 in a cross formation, spatulate to narrowly oblanceolate, 6-12 mm long, yellow. Fruits: Capsules nearly globose to ellipsoid, 4-6 mm long, sparsely pubescent; seeds somewhat flattened, 4-8 per locule. Ecology: Found in pinyon-juniper, ponderosa pine, Gambel oak, and sagebrush communities, often in sandy soils, from 5,000-9,500 ft (1524-2896 m); flowers April-June Distribution: AZ, CO, UT, NM Notes: Physaria species (until recently classified as Lesquerella) have gray-green leaves, often with stellate hairs; white or yellow 4-petaled flowers; and round, globe-shaped fruits with a persistent style attached to the tip. P. rectipes is a fairly common species in the four-corners region, distinguished by its hairy seed pods and basal leaves 3-5 mm wide with flat margins and usually no clear division between blade and petiole. 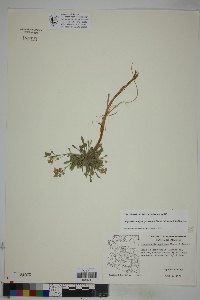 Physaria spp. can be challenging to properly identify in the field; try to make a good collection so you can key it out using a dissecting scope. Ethnobotany: Unknown, but other species in the genus have uses. Editor: AHazelton 2017 Etymology: Physaria comes from the Greek phusa or physa, "bellows" because of the inflated pod; rectipes translates to "straight foot," possibly a reference to the straight stems.